The organizational meeting for the Gallia County Retired Teachers was held in July of 1970 at the request of Marguerite Hineman and with the assistance of District Director, Kathryn McCall. Marguerite then served as the Chapter's first president.Meetings are now held six times each year at different churches and restaurants. The group's newsletter is mailed to 260 members. Each year one student from each of the county's three high schools, who is entering college as an education major, is given the Kathryn Williams Scholarship. 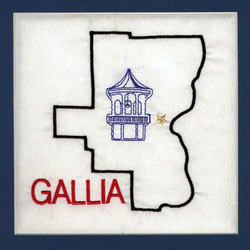 The names of four state presidents are found on the membership list of Gallia County Retired Teachers. They are: Irene Brannon, 1984; Albert Durose, 1988; Jean Mills, 1999 and John MIlhoan, 2002.